The Highlands Center for Natural History is a wonderful educational resource for the local community. Students and adults alike are taught the importance of appreciating and preserving nature. Easy hiking trails, nice picnic areas, an abundance of ways to learn - The Highlands Center for Natural History is a great way to spend an afternoon. What can I see and do at the Highlands Center? Take a short, family-friendly hike around the highlands center and learn all about the area with the neatly provided signs along the trail. 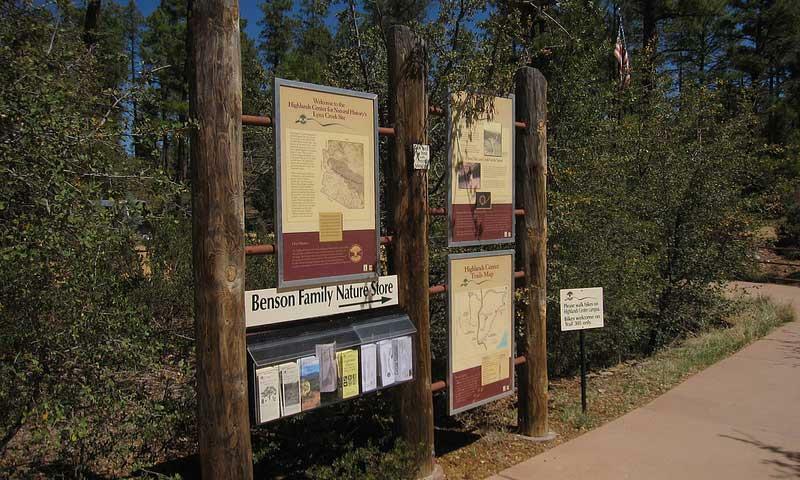 Peruse the Benson Family Nature Store or speak with one of the volunteers to discover even more, or sign up for one of the many classes during your Prescott stay. Where is the Highlands Center? The Highland Center is located at 1375 S. Walker Road. From Prescott, head up Highway 69, towards Prescott Valley. Hang a right on Walker Road and look for the clearly marked signs indicating the park. When is the Highlands Center open? The trail is open 8AM through 6PM, October through March, and 7Am – 7PM, April through September. The Benson Family Nature Store is open from 10AM to 3PM, October through March and 9AM to 4PM April through September, and is closed Sundays and Mondays. It is free to visit the Highlands Center, but there are numerous classes available for a nominal fee. Contact the center directly at 928-776-9550. The Highlands Center for Natural History is an outdoor science and environmental education center in Prescott, Arizona.